I'm packing for my trip to Albuquerque. It's so much fun to take out quilts and decide which ones get to go into my magic suitcases! The class this weekend is sold out, but there may still be tickets for the lecture/trunk show tomorrow night. Check out Hip Stitch for more information. Oh, and I updated the Fall Teaching Schedule tab above with my upcoming teaching gigs and events. Check it out to see if I'm coming to your neck of the woods. I have more to add, so keep checking back! I also packed and sent Building Bridges and the Shattered quilt off to Quilts Inc. for the Modern Quilt Showcase at Quilt Market. If you'd like another look at those quilts, they (and me) are on an episode of "Quilty" that you can see here. I had so much fun taping the show. Mary and Rebecca Fons are great and totally a ball to work with! Jacquie - I just watched the clip of you on QNN and enjoyed seeing you and your gorgeous quilts! How exciting. I own a copy of your book and today dropped off my first wonky log cabin quilt to get quilted. Thanks for inspiring us all! Save travels and may you wow! your audience and they wow! you! Always nice to learn! I signed up for both events in Albuquerque. They're all I've thought about for weeks. See you tonite! Safe travels. Thank you for this link! I really enjoyed it. I'm probably your biggest fan, but live too far away to make what's on your schedule now. My quilt guild makes up it's schedule a couple of years in advance, but I'm lobbying big time to get you here!!!! It's so wonderful to hear your lovely voice talking about quilts again! Two very stunning quilts, Jacquie. You know why I want to make quilts? I want to make them so that I can stack them up and take pictures of them! 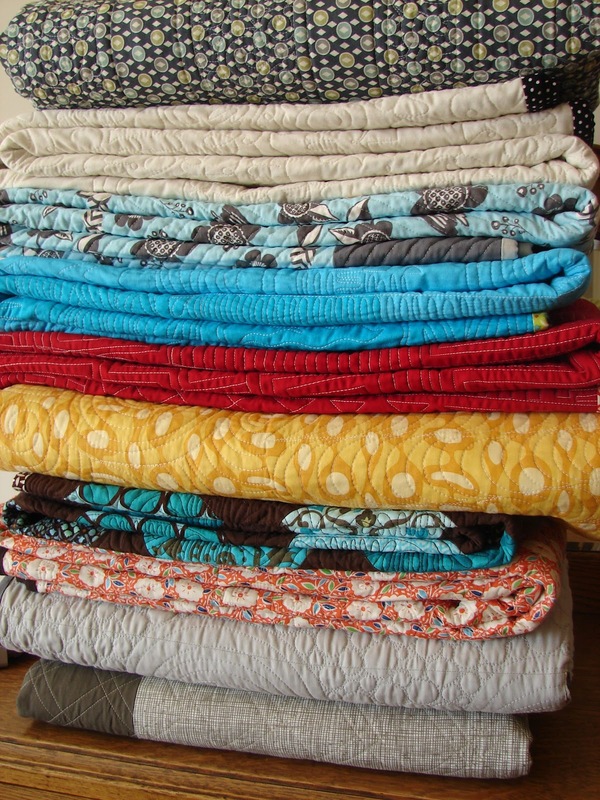 What's better than a picture of a stack of quilts? Aaaah, they look so comfy.